FDC and LION join forces to raise funds for Firefighter Cancer Support Network, a nonprofit aiding firefighter battling cancer nationwide. 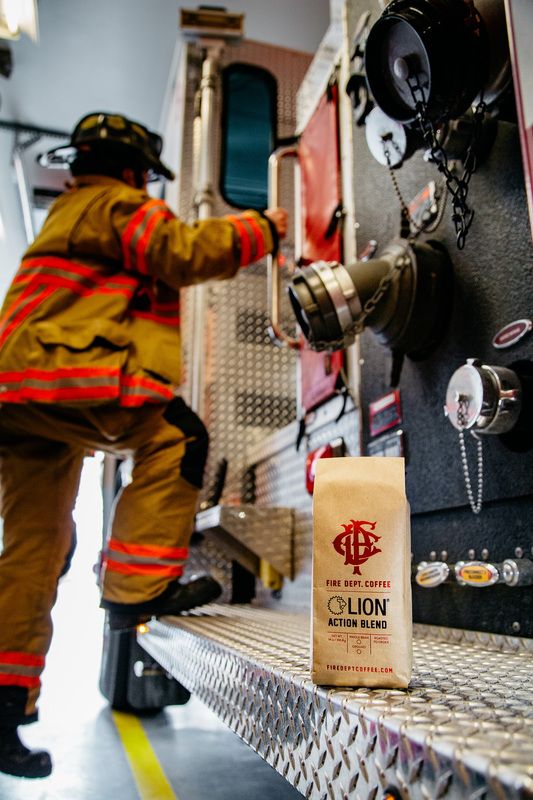 Fire Department Coffee and LION, the largest family-owned manufacturer of first responder personal protective equipment (PPE) in the United States, will be launching LION Action Blend Coffee Roast on April 10, 2019. 100% of the proceeds to benefit the Firefighter Cancer Support Network (FCSN). For the men and women who risk their lives daily in the fire service, cancer is one silent occupational hazard that’s steadily growing. Cancer is the most dangerous and unrecognized threat to the health and safety of our nation’s firefighters. Multiple studies have repeatedly demonstrated credible evidence and biologic credibility for statistically higher rates of multiple types of cancers in firefighters compared to the general American population, according to FCSN 2013 White Paper - "Taking Action Against Cancer in the Fire Service"
Firefighter Cancer Support Network goes beyond raising financial support and awareness about the occupational cancer threat and the importance of early screening. They lend a hand, provide support, and offer guidance from the beginning stages of diagnosis to ensure the firefighter and family members are not alone. “Fire Department Coffee is passionate about two things: making high quality, great tasting coffee and supporting our brothers and sisters in need. When we decided to partner with LION to raise money for the Firefighter Cancer Support Network, we wanted to create a coffee that captured the essence which all our brothers and sisters are called to do every day—Action. No matter how tired, how sick, how run-down we are, we must always be ready for Action,” said Schneider. Fire Department Coffee’s Chief Roaster and retired Fire Captain, David McWilliams, served in the fire service for 35 years. In 2018, McWilliams was diagnosed with Advanced Malignant Melanoma. In addition to offering a mentor, the FCSN provided a “Toolbox” care package of useful information and supplies to keep organized throughout the journey. All the proceeds from the new LION Action Blend Coffee will go to support FCSN in their mission. This new medium-dark roast has a bold flavor with a little extra kick to support our hardest working men and women. Available for purchase at www.firedeptcoffee.com. LION will be showcasing the LION Action Blend at Fire Department Instructors Conference (FDIC) International, booth #1323, from April 11-13. Luke Schneider launched the Fire Dept. Coffee in July of 2016 with the mission to make great coffee with an even greater mission to support our nation’s heroes in need. 10% of proceeds from every order goes towards supporting ill or injured firefighters and first responders. Connect with Fire Dept. Coffee on social media by following @firedeptcoffee on Facebook, Instagram, and Twitter.